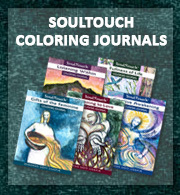 SoulCards are evocative images meant to bring the wisdom of the soul into awareness. There is no definitive meaning attached to each card, and no book to refer to for the answer to your inquiry. These simple steps encourage you to allow the insight of your own soul to emerge. 1. Think of a current issue in your life. 2. Draw a card at random. 3. Gaze at the image without interpreting it. 4. Describe what you are perceiving in the image. 5. Relate what you perceived in the image to your issue. In 1974, I discovered Touch Drawing (that’s another story) in a moment of playful exploration. When touching a paper towel which had been placed on a freshly inked printing plate, I found that the pressure formed lines on the underside. Lines coming directly from my fingertips! I laughed hysterically with this discovery. In a state of ecstatic revelation, childlike images poured from my hands. Although this experience had the appearance of simply being play, under the surface was something profound and powerful. It was as if I was receiving a gift from outside of time, from an invisible knowing presence. 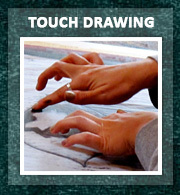 While sensing that I was acting on behalf of a great evolutionary force, I began to pour my soul into Touch Drawing. It became my personal lifeline. During difficult times I would turn to the drawing board to release emotions. As I accepted my feelings and allowed them to pour onto the page through my hands, I was drawn more deeply into myself. It was as if I was sculpting my own being – transforming, literally before my own eyes. At the end of a session I had a record of this transformation: images of my soul in motion. And I would feel clear and whole. Now SoulCards has been joined by SoulCards 2, a sister deck of sixty more unique and powerful images that are offered without interpretation for the purposes of reflection, inspiration, and creative delight. These images come into the world through a process called Touch Drawing, which was given to Deborah in a state of playful revelation during a mundane cleanup task on her last day of art school 26 years ago. 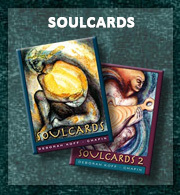 Sixty images in each deck offering no interpretations, no scholarly dissertations and no pre-fabricated answers to life’s questions, yet SoulCards have inspired the imagination of thousands of people throughout the world. 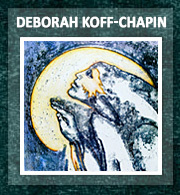 Will McGreal, who first introduced Koff-Chapin’s images to the world, reflects on the “how” and “why” SoulCards work and the fear they refuse to let us negotiate. In his article below, McGreal encourages us to get off the path and say goodbye to a yellow brick road that runs on interminably somewhere other than the Kansas of our daily lives. I’M IN A BOOKSTORE WITH SOME TIME SET ASIDE TO CHECK OUT SOME CD’S. The clerks recognize me from the days when I used to root through the New Age titles. Even now as I pass the column of books on astrology and crystals, I slow down to see if anything leaps out. Nothing. Wait. What’s this about?. Oh… Been there. Done it. Off to the racks of CD’s. The sliver of disappointment barely penetrates my skin but I know I’ve been pricked again by that feeling that somewhere, out there, lies something that will change my life forever. Something to draw me onto that one, final Journey to the Self.